I didn’t cover nearly as many miles this month as last. Of course, last month I was on a plane going around the world and rattling about Australia and Asia. This month I rode 594 1/2 miles. 331 1/2 miles were aboard Little Nellie, my Bike Friday. Another 88 1/2 miles covered while riding The Mule, my 1991 Specialized Sequoia touring bike, to and from work three times. The rest of the mileage was from weekend rides aboard my new Cross Check. I rode to work 14 times and did one 67-mile event ride, the Great Pumpkin ride. I also did two hikes: one in Great Falls Park in Maryland, the other in Prince William Forrest Park in Virginia. For the year, I have ridden 6,263 1/2 miles. About half that total was on The Mule. Another 2,500 miles were split between Little Nellie and Big Nellie, my Tour Easy recumbent. My Cross Check now has 541 miles on it. I’ve done 135 bike commuted for a total of 4,127 miles. I’m trying to pace myself. Honestly. 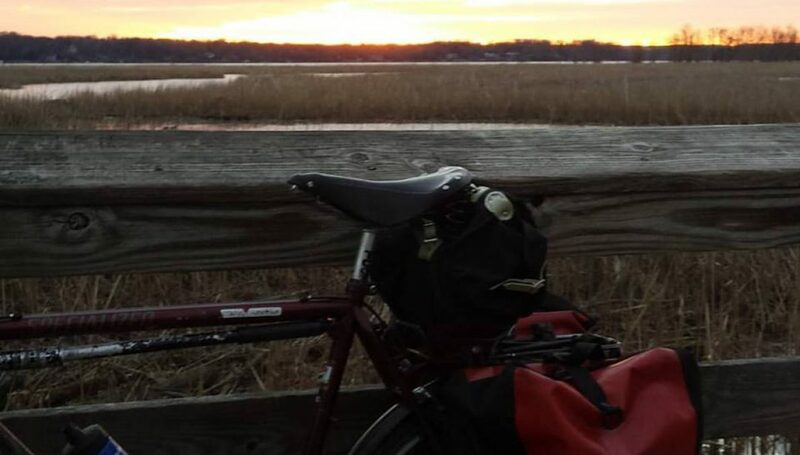 Posted on November 4, 2015 by rootchopperPosted in Bike CommutingTagged bike commuting. Miles and I’m done of course. My commuting miles are about 60% of my totals. Looks like a pretty nasty surgery. Hope you mend quickly and completely. You’ll be out there rolling down the roads in no time.